MCM Comic Con Birmingham was my first convention of the year, the convention tends to be smaller than the later ones with less A-list guests, it’s a good way of easing into the year for me. I decided I’d dress as The Flash again as winter has been busy and stressful with little time to prepare, I asked Mum to tweak a few things, she made a hood from a T-Shirt and painted Flash wings on the side, resprayed my boots and did some other minor things within a week. I really wanted to get my LED lights working again but didn’t get chance, I have to rely on friends to do soldering and other electrical stuff as although I have the knowledge I can’t physically do the work myself anymore. The main guests this time were Billie Piper and the Starsky and Hutch cast, they had two cars from the show on display and you could also pay to go for a ride in one with the actors, a very nice touch and a one off experience for fans. When we got there my special assistance pass allowed us quick entry without queueing, things were smoother this year than my last MCM in London where they seemed confused about the procedure, fingers crossed this continues. My first stop was a photo shoot with Billie Piper, I’ve really enjoyed her as Brona and Lily in Penny Dreadful so wasn’t going to miss an opportunity to meet her. Photo shoots are always rushed but she seemed to be really friendly and nice, it was more relaxed than many where it’s in, snap, next. I then wandered round looking at stalls and props for a bit, this year the convention was in two halls which really helped, there was space to actually look at things and it wasn’t too crowded to just enjoy walking around. The variety of stalls was also great, not too anime focused like some recent events, I don’t mind anime at all but I like to see a good selection of geek culture not just one. I had arranged to meet up with a friend and her little boy this time so the next stop was the kidszoe by a giant minion, this was a really good area with lots of space with bean bags and some toys so parents and there children could relax a bit. There was also Jedi training in this area which my friend’s son really enjoyed, although maybe not as much as his Mother, the trainers were friendly and very patient they gave everyone a really fun experience. The only talk I managed to attend was Billie Piper, I had hoped to catch Vic Mignogna and Starsky & Hutch, but the DC and Marvel United photo shoot overlapped one and time ran out for the other. Billie’s talk was very relaxed and consisted of a few questions from the host followed by lots of questions from the audience, she was very friendly and honest with everyone and the whole thing was really pleasant, don’t expect to see her starring in Doctor Who as a regular again though as unless they move shooting to London so she can spend time with her family she wouldn’t do it. The day was really good and I was glad I went, lots of people wanted to take a photo with me, and of me, and I attended my first group photo shoot which has made me feel more of a member of the cosplay community. The other cosplays as always were great to see with lots getting into the spirit, I was surprised to not see any Beauty and The Beast cosplays or Iron Fist, maybe next time as both were released only just before the event. There were some good professional cosplays this time along with the amateur ones, such as zombies and also the great UK Garrison. My next convention is MCM London which should be great, I’d like to attend i60 but I don’t currently game or have a gaming cosplay so well skip it this year. I’m also considering applying for a press pass for future conventions with encouragement from my cousin who does music events (he designed the logo above for me), I am not sure I have the confidence but maybe as a photographer I’d be okay. You can see my pictures from the day below and on Flickr. 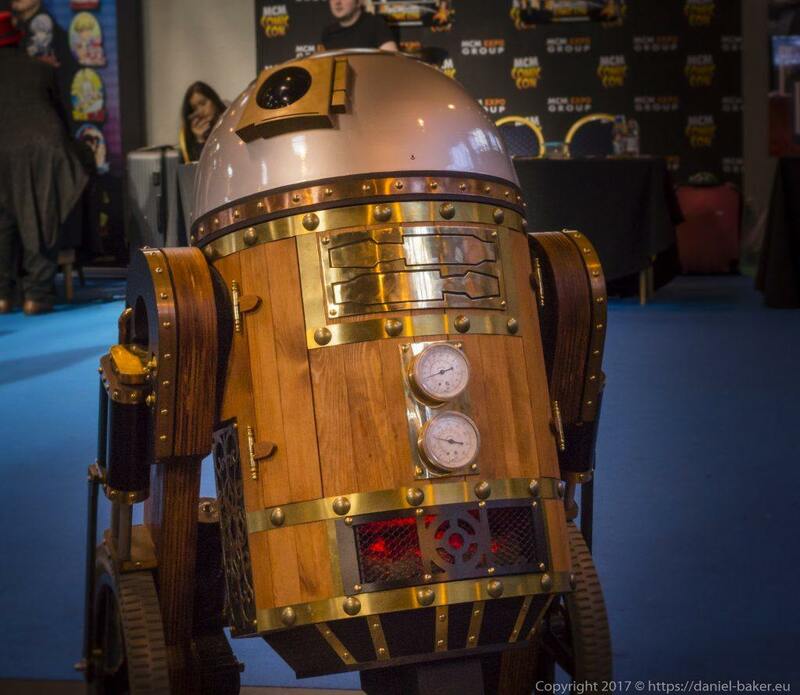 This entry was posted in Geeky and tagged #mcmBHM17, accessibility, comic con, cosplay, Duchenne Muscular Dystrophy, MCM, NEC. Bookmark the permalink.